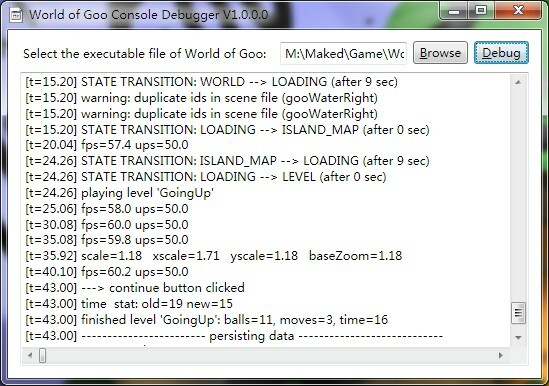 This is a program which can get the console output of World of Goo. But there's some delay because I use the file stream. I try to redirect the output stream to my program but it doesn't work. Waiting for someone to fix this. You need to install .NET Framework 4 Client Profile to run V1.0.0.0 which has a GUI, get it here. You can run 2.0 without .NET. With this program, you can learn a lot about World of Goo, e.g. how World of Goo upload your records, how World of Goo get the rank of your tower in World of Goo Corporation. P.S. I got this idea from this page. The source code of 2.0 is so short that I can post it here. Please upload it as an exe - you have access now. You know this can be done with DbgView, right? The result of the Debug View is quite different from mine. There's more information my program can get. Oh cool, how are you getting it? is it the stdout of the program? Yes, it is. I use WorldOfGoo.exe >output.txt to redirect the standard output, then read the output.txt and show it. >mfw this addin is higher than GooTool in the list of utility addins. Wait, is this written in Pascal? 2.0 is written in Pascal and its 4-line source can be found in the description. Both of them used some batch. C# and Pascal are my most frequently used language. When I going to make a GUI or do a complex operation, I will probably use C#. And I use Pascal to participate in the competition. These programs probably work for some of the other programs too. You can try it. I was just wondering, I had never seen something in Pascal before. I had thought it was essentially a dead language now.